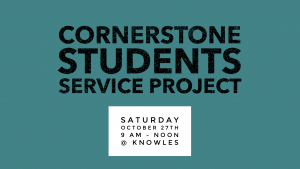 Students 6th – 12th grade meet at the front of Knowles at 9 am. We will be assisting the librarian with library clean up and packing after the week-long book fair. Contact students@cornerstonecommunity.com for more information.